NEW YORK (AP) — A New York City police officer was shot to death early Wednesday, ambushed inside a mobile command post by an ex-convict who had ranted online about his treatment in prison and about officers getting away with killing people, authorities said. The gunman was killed by police about a block away. Miosotis Familia, a 12-year member of the force, was writing in her notebook in the front seat of the RV-like vehicle when the killer strode up to it in a Bronx neighborhood around 12:30 a.m. and fired one round through the passenger-side window, striking her in the head, authorities said. 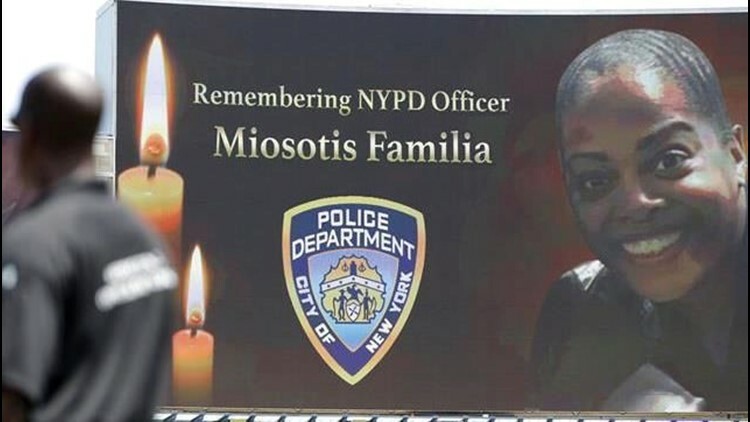 "PO Miosotis Familia has been assassinated in an unprovoked attack on cops assigned to keep NYers safe," Police Commissioner James O'Neill tweeted. Her partner radioed frantically for help, and police caught up to 34-year-old Alexander Bonds, who was gunned down after pulling a revolver, police said. Witness Jay Marzelli told the Daily News that he was getting a sandwich at a bodega and thought the shots were Fourth of July fireworks at first. "All of a sudden there was all this running and stuff going on, and I look out, probably 40, 50, 60 cops screaming, 'Call a paramedic, clear the block!'" he said. "It looked like there was a riot going on, and two seconds later I hear gunshots, 'Bam, bam.'" Familia, 48, had been stationed inside the mobile command post, which had been set up in the high-crime neighborhood since March after a triple shooting and was manned around the clock. Bonds was sentenced to six years in Attica prison in an armed robbery case out of Syracuse and had been paroled in 2013. He had other prior arrests, including one in 2001, when as a teenager he was accused of attacking an officer with brass knuckles. In a video posted on Facebook in September, the Bronx man ranted about the treatment of people by officers and talked about how hard life was behind bars. At another point, he said into the camera: "I'm not playing, Mr. Officer. I don't care about 100 police watching this." And: "It's time for people to wisen up." Police said they were trying to identify the motive for the shooting. While tensions have been running high between police and black people around the country, there was little or no immediate indication the killing had a racial dimension. Bonds was black; Familia was black and Hispanic, her family hailing from the Dominican Republic. She apparently had no previous contact with Bonds. The shooting recalled the 2014 ambush killings of two New York City officers who were shot in their cruiser by a man who approached the passenger window. The gunman, 28-year-old Ismaaiyl Brinsley, then killed himself. Brinsley had announced online in the moments before the attack that he was going to shoot two "pigs" in retaliation for the police chokehold death of Eric Garner. In the latest shooting, Bonds was caught on video leaving a convenience store, then moving tightly along the wall, pulling his hoodie over his head and walking purposefully toward the police vehicle. The video didn't capture the shooting itself but showed him running away with a gun in his hand, police said. Familia, a mother of three, including a set of twins, lived with her mother and worked the midnight shift in the Bronx. Family and friends said she became an officer to help her community, and her family was heartbroken. "Put it this way: She'd give you the shirt off her back. She was the sweetest person you ever want to meet," downstairs neighbor Tom Ritter said. He said his son, now 22, played with Familia's children, and she practically "adopted" him. When he heard that she had been shot, he said, "My heart dropped." Officers stood at attention and saluted as an ambulance carrying her body left the hospital. This story has been corrected to show that Bonds said people should "wisen up," not "rise up." Associated Press writers Jennifer Peltz, Tom Hays and Karen Matthews in New York contributed to this report.